This open, airy restaurant with ocean views features Italian cuisine made with local ingredients. 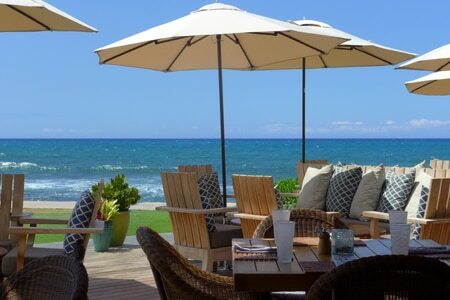 : Enjoy a taste of Italy al fresco at this open, airy restaurant wedged between the Beach Tree pool at Four Seasons Resort Hualalai and the sandy shores of the Kona coast. The covered dining room leads out to a patio and a bar and lounge area that is also a perfect setting for comfortable, casual dining. Dynamic chef de cuisine Nick Mastrascusa serves Italian cuisine using local ingredients, like the Puna goat cheese topping a pizzetta special. Mastrascusa even partnered with a Tuscan olive oil producer on a private label of extra virgin olive oil for the restaurant. The breads turned out by the bake shop are also a point of pride. Among them are the brioche rolls for the grass-fed “B.I.” burger. Menu mainstays like the gnocchi with oxtail ragoût appear alongside additions such as the shortrib risotto with Hamakua mushrooms as well as the “grigliata mista” (mixed grill) of lobster, opah, shrimp, hearts of palm, celery and fennel. A breaking wave of chocolate crowns the Chocolate Rip Curl dessert, while the chocolate budino is accompanied by mini malasadas (Portuguese doughnuts). The Batik Room Bon Bons, Circa 1964 draw inspiration from a dessert once featured at the Mauna Kea Beach Hotel. The short and worldly wine list is sorted by price and varietal. There are also local beers and specialty cocktails such as the signature Beach Tree Smash made with Grey Goose La Poire, Asian pears, limoncello and lime agave nectar.